One of the great things about the BWCAW is that it provides excellent routing options for people of varying interests and abilities. Everyone deserves the rejuvenating spirit of the outdoors in the Boundary Waters. Consider the below issues and complete our Routing Form. Then we'll email you several great route options complete with interactive maps, comprehensive route specifications, and trip highlights. This will affect the nature of the trip, and is a good place to start. It helps if the group has generally similar interests for the adventure. Remember the maximum group size in the Boundary Waters is nine people. 2) When are you going? Pick a window of time. When you have flexibility on your entry date, you may have more options for your route since entry permits are allotted by specific entry date. There is no one best time to visit the Boundary Waters. Here are some considerations. Click here for average weather conditions. The best fishing is typically in May and June, though superb fishing exists through the summer. Bug condition considerations. Black flies (gnats) are typically more significant from mid May through June. Bug spray with the ingredient MGK repels black flies. Mosquitoes are typically more significant from June through mid-August. DEET repels mosquitoes. The bugs are typically not a problem when you are prepared for them. We sell effective mosquito repellents. Long nylon pants and long sleeves will also ward off the bugs. Peak use season is mid-June through mid-August. During that time, you may need to be more flexible on your desired entry date to obtain the entry permit that best suits your interests. 3) How many days on trail? A Boundary Waters experience is worth it even if you're short on time. However, it often takes a couple days to adjust your mindset away from the connected electronic lifestyle, cellphone rings, the sound the cellphone makes when it's on vibrate, emails, texts, and Facebook updates. After a couple days in the woods, people tend to connect more with the natural world around them. Thus, we recommend at least a five or six day trip if you're able. Of course, vacation time is at a premium and it can be tough to fit everything into busy schedules. We can help you have a fun canoe trip even if it's just two or three days. 4) What is your group's experience, age, and fitness level? Boundary Waters experience. We help people of all experience levels have successful trips. We are happy to talk you through your interests and expectations and recommend a route that fits your desires. If you've been to the BWCA before, tell us what you liked best and least about those trips, and we'll use that info to make recommendations. If this is your first Boundary Waters experience, we will talk you through the details. Backcountry camping experience. With backcountry camping (e.g., backpacking) experience, you have a real leg up on understanding how to camp in the wilderness and handle being away from civilization. We find that groups with extensive backcountry experience excel in the BWCAW and handle more challenging routes. Canoeing experience. If your group is light on canoeing experience, you may want to plan a shorter first day while everyone ramps up their paddling skills. You may also want to plan a route that avoids wind-prone larger lakes that may have larger waves. With more canoeing experience, you'll travel more efficiently and farther. Age and fitness level. People of all ages and abilities have outstanding Boundary Waters experiences. With younger kids, consider staying at one campsite for at least two nights so they have time to adjust, and consider a route with occasional portages to mix up the day. With high fitness levels, you will typically travel farther. 5) What are your group's particular interests? How many different campsites will you have? Just one for the whole trip? A new campsite every night? A couple nights here and a couple there? Remember that setting up and taking down camp is a time-consuming process. And, when spending multiple nights at the same campsite you are able to canoe on long day trips to explore and fish and then return later in the day to a camp that is already set up. How physical should your trip be? Easier, more difficult, or most difficult? Generally, more physical trips have longer travel days and more frequent and longer portages. An average travel day in the Boundary Waters covers 6 - 7 miles. What are your fishing goals and desired species? With a high interest in fishing, consider fewer travel days so you can maximize fishing time over time setting up and taking down camp. And be aware that all lakes do not have all species of fish. What does solitude mean to you, and do you prefer a route with no motorboats? A day or two paddling from an entry point can pay off with an increased sense of solitude. But, relative solitude and calm can be found nearer to entry points also. Do you have a particular interest in waterfalls or Native American pictographs (rock paintings)? We can recommend routes with these. 6) Professionally guided or self-guided? A self-guided wilderness canoe trip provides a level of personal freedom and self-reliance that can be extremely satisfying. When it's just you and your family and friends, journeying together in traditional canoes, living simply, cooking meals over a fire, finding your way with only a map and compass and your own orienteering skills, you return with a special sense of accomplishment. This requires particularly careful planning and preparation. A professionally guided canoe trip makes your trip planning simple, and ensures you have a knowledgeable person along every step of the way. Our professional, local guides provide a wealth of canoeing and wilderness skills. And they're happy to share. Take the worry out of navigation and basic wilderness travel issues and let our guides share the wilderness with you. You'll learn more and, if you're fishing, you'll catch more fish with a professional guide along. All Boundary Waters Guide Service guides are licensed, insured, family-friendly, and fun to have along on your trip. Guided trips are completely outfitted with the highest quality Kevlar canoes, camping equipment and delicious trail meals. Just bring your camera, things you wear, and optional fishing equipment and we provide the rest. Click here for our guided trip options. 7) Complete Outfitting Package, Partial Outfitting Package, or Individual Canoe and Gear Rentals? Specialized canoeing and camping gear tailored to the Boundary Waters is what you'll find in our outfitting shop. When outfitting with us, you'll use the same equipment used by the most trail-savvy wilderness travelers of our area. And we provide plenty of optional creature comforts to enhance your trip. Complete Outfitting Package. Our Complete Outfitting Package is the simplest way to ensure you have everything you need for your adventure. 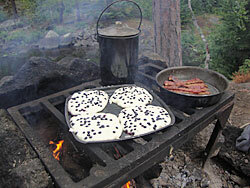 We provide the quality ultra-light Kevlar canoes, camping gear, and delicious camp food for your successful trip. We'll provide expert trip planning assistance and show you how to use all the gear. Click here for more info. Partial Outfitting Package. Partial Outfitting Packages are a good option if you already have some of your own gear. You can select a Kevlar Canoe and Deluxe Food Package, Kevlar Canoe and Camping Equipment Package, a Deluxe Food Package, and an add-on Fishing Pole Package. Individual Canoe Rentals and Camping Equipment Rentals. Already have your own gear? Just need to rent a canoe or a few things. Click here for our canoe and gear rentals. With over 70 BWCAW entry points and 1,200 miles of canoe routes, the possibilities can seem endless. The most efficient way for us to get you excellent route options that fit perfectly with your interests is to complete our simple online Routing Form. Then we'll email you several route options complete with interactive maps, comprehensive route specifications, and trip highlights. A quota entry permit is required for all BWCAW camping trips launching from May 1 through September 30. One entry permit is good for a group of up to nine people. Permits are allotted based upon a specific entry point and entry date. We will check permit availability and reserve your required entry permit. Entry permits for summer 2019 become available on a first-come, first-served basis on January 30, 2019. For best availability, it is best to reserve your permit ASAP. The longer you wait the more flexibility you may need for your preferred entry point and entry date. 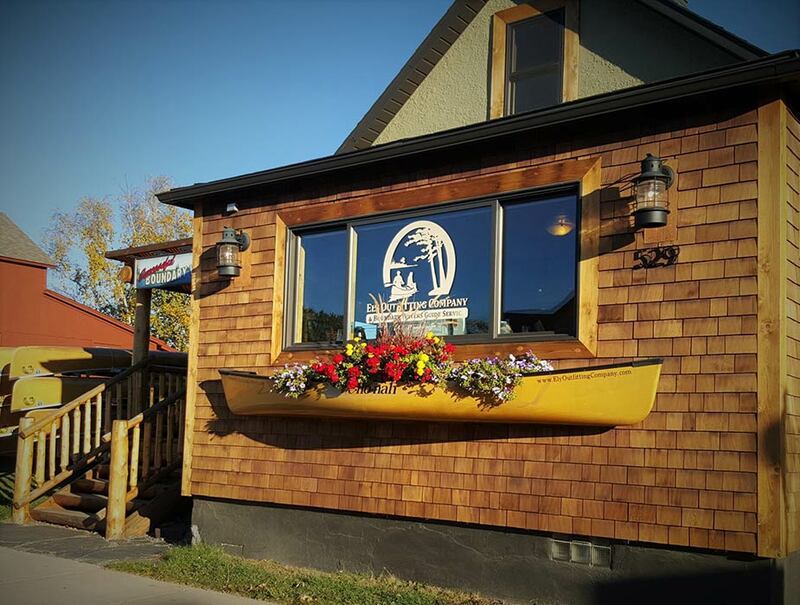 The Ely Outfitting Company bunkhouse is private, clean, comfortable, next door to our shop, and within easy walking distance of downtown Ely restaurants, shops, and entertainment. Learn more about our bunkhouse and Ely's varied lodging options here. We're experts at the trip planning process, and we're happy to help! Reach us with our online contact form, at info@ElyOutfittingCompany.com, or by phone at 218-343-7951.